This article is about the App Service Environment v1. There is a newer version of the App Service Environment that is easier to use and runs on more powerful infrastructure. To learn more about the new version start with the Introduction to the App Service Environment. The App Service Environment (ASE) feature is a Premium service option of Azure App Service that delivers an enhanced configuration capability that is not available in the multi-tenant stamps. 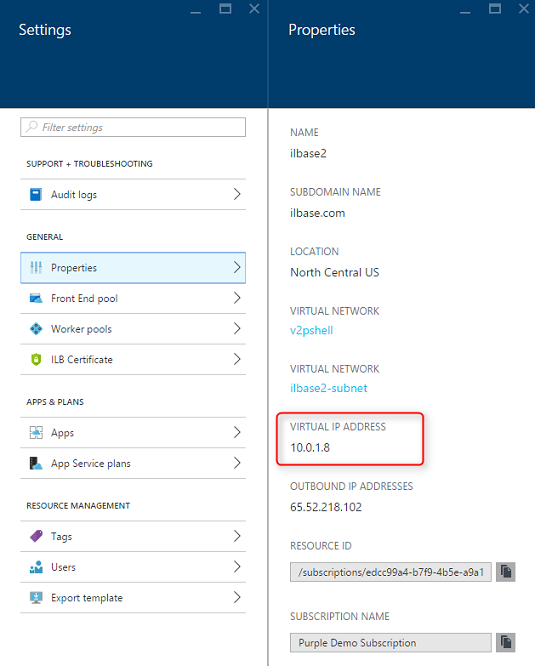 The ASE feature essentially deploys the Azure App Service in your Azure Virtual Network(VNet). To gain a greater understanding of the capabilities offered by App Service Environments read the What is an App Service Environment documentation. 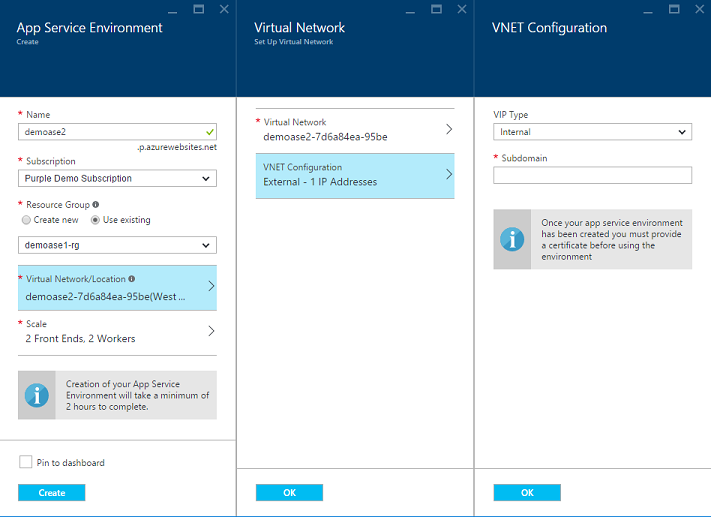 If you don't know the benefits of operating in a VNet read the Azure Virtual Network FAQ. your own domain or subdomain. To make it easy, this document assumes subdomain but you can configure it either way. DNS management for your subdomain. buying and using a certificate with an app through the portal. 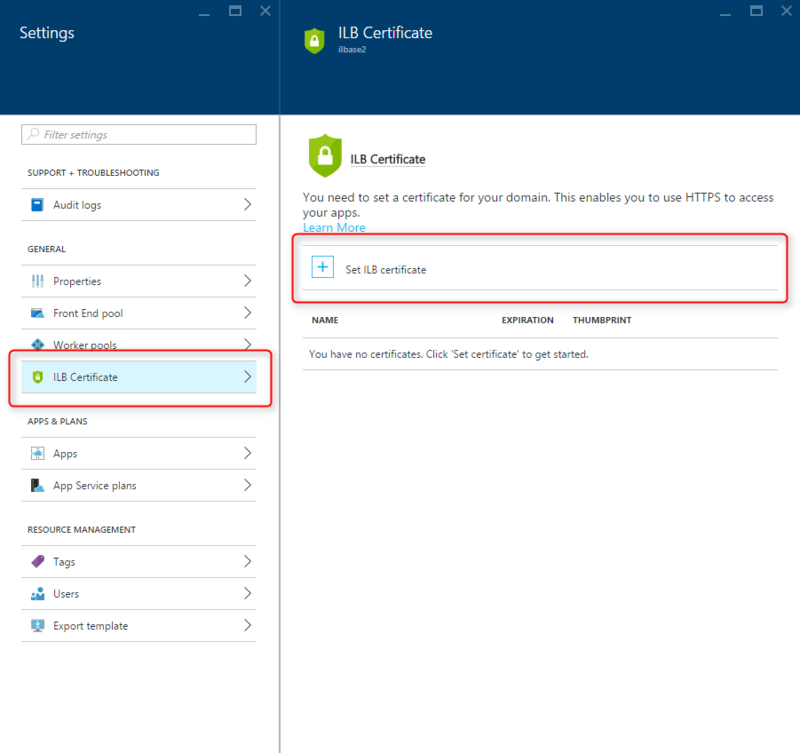 You can, of course, still obtain certificates directly with a Certificate Authority and use it with your apps, but not through the Azure portal. In the Azure portal, select Create a resource -> Web + Mobile -> App Service Environment. Select or create a resource group. Select or create a VNet. Create a subnet if selecting a VNet. Select Virtual Network/Location -> VNet Configuration and set the VIP Type to Internal. Provide a subdomain name (this name is the subdomain used for the apps created in this ASE). Select OK and then Create. In the Virtual Network pane, there is a VNet Configuration option that lets you select between an External VIP or Internal VIP. The default is External. If you have it set to External, your ASE uses an internet accessible VIP. If you select Internal, your ASE is configured with an ILB on an IP address within your VNet. After selecting Internal, the ability to add more IP addresses to your ASE is removed and instead you must provide the subdomain of the ASE. In an ASE with an External VIP, the name of the ASE is used in the subdomain for apps created in that ASE. If your ASE is named contosotest and your app in that ASE is named mytest, the subdomain is of the format contosotest.p.azurewebsites.net and the URL for that app is mytest.contosotest.p.azurewebsites.net. If you set the VIP Type to Internal, your ASE name is not used in the subdomain for the ASE. You specify the subdomain explicitly. If your subdomain is contoso.corp.net and you made an app in that ASE named timereporting, the URL for that app is timereporting.contoso.corp.net. Creating an app in an ILB ASE is the same as creating an app in an ASE normally. In the Azure portal, select Create a resource -> Web + Mobile -> Web or Mobile or API App. Enter the name of the app. Select or create an App Service Plan(ASP). If creating a new ASP, select your ASE as the location and select the worker pool you want your ASP to be created in. When you create the ASP, you select your ASE as the location and the worker pool. When you specify the name of the app, you will see that the subdomain under your app name is replaced by the subdomain for your ASE. Select Create. Be sure to select the Pin to dashboard checkbox if you want the app to show up on your dashboard. Under the app name the subdomain name gets updated to reflect the subdomain of your ASE. An ILB ASE is slightly different than the non-ILB ASE. As already noted you need to manage your own DNS and you also have to provide your own certificate for HTTPS connections. After you create your ASE, you will notice that the subdomain shows the subdomain you specified and there is a new item in the Setting menu called ILB Certificate. The ASE is created with a self-signed certificate which makes it easier to test HTTPS. The portal tells you that you need to provide your own certificate for HTTPS, but this is to encourage you to have a certificate that goes with your subdomain. If you are simply trying things out and don't know how to create a certificate, you can use the IIS MMC console application to create a self-signed certificate. Once it is created, you can export it as a .pfx file and then upload it in the ILB Certificate UI. When you access a site secured with a self-signed certificate, your browser gives you a warning that the site you are accessing is not secure due to the inability to validate the certificate. If you want to avoid that warning, you'll need a properly signed certificate that matches your subdomain and has a chain of trust that is recognized by your browser. Go to ASE UI after ASE is created ASE -> Settings -> ILB Certificates. Set ILB certificate by selecting certificate pfx file and provide password. This step takes a little while to process and the message that a scaling operation is in progress appears. Get the ILB address for your ASE (ASE -> Properties -> Virtual IP Address). Create a web app in ASE after creation. Create a VM if you don't have one in that VNET (Not in the same subnet as the ASE or things break). Use a browser on that VM and go to https://mytestapp.ilbase.com (or whatever your web app name is with your subdomain). Use a browser on that VM and go to https://mytestapp.ilbase.com. You must accept the lack of security if using a self-signed certificate. The IP address for your ILB is listed in your Properties as the Virtual IP Address. An ILB ASE enables network isolation for your apps. The apps are not accessible or even known by the internet. This approach is excellent for hosting intranet sites, such as line-of-business applications. When you need to restrict access even further, you can still use Network Security Groups(NSGs) to control access at the network level. If you wish to use NSGs to further restrict access, you must make sure you do not break the communication that the ASE needs in order to operate. Even though the HTTP/HTTPS access is only through the ILB used by the ASE, the ASE still depends on resources outside of the VNet. To see what network access is still required, see Controlling Inbound Traffic to an App Service Environment and Network Configuration Details for App Service Environments with ExpressRoute. 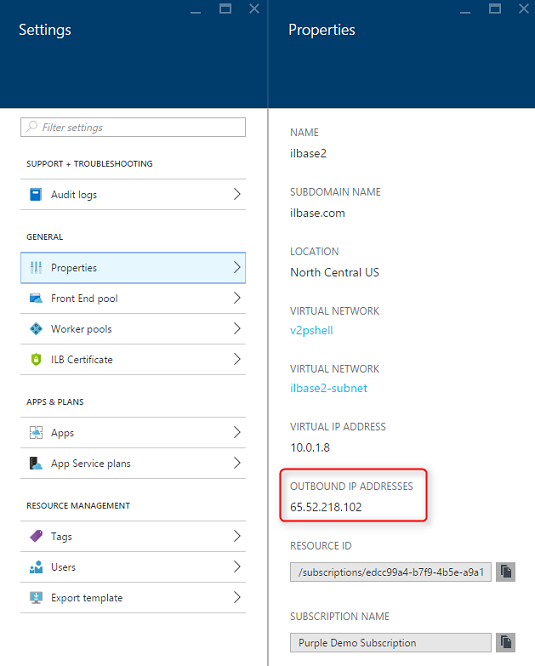 To configure your NSGs, you must know the IP address that is used by Azure to manage your ASE. That IP address is also the outbound IP address from your ASE if it makes internet requests. The outbound IP address for your ASE remains static for the life of your ASE. If you delete and recreate your ASE, you will get a new IP address. To find the IP address, go to Settings -> Properties and find the Outbound IP Address. Managing an ILB ASE is largely the same as managing an ASE normally. You must scale up your worker pools to host more ASP instances and scale up your front-end servers to handle increased amounts of HTTP/HTTPS traffic. For general information on managing the configuration of an ASE, see Configuring an App Service Environment. The additional management items are certificate management and DNS management. You must obtain and upload the certificate used for HTTPS after ILB ASE creation and replace it before it expires. Because Azure owns the base domain, it can provide certificates for ASEs with an External VIP. Since the subdomain used by an ILB ASE can be anything, you must provide your own certificate for HTTPS. 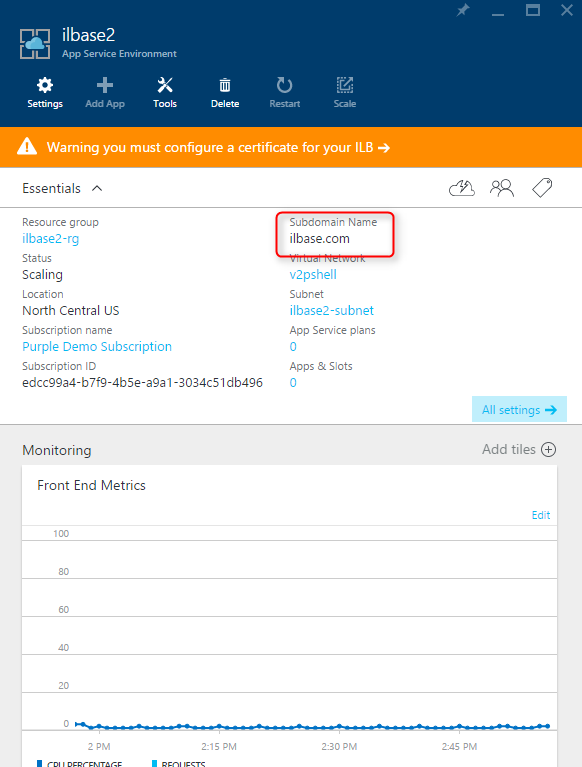 If you want to get started with Azure App Service before signing up for an Azure account, go to Try App Service, where you can immediately create a short-lived starter web app in App Service. No credit cards required; no commitments.